Pioneers of Religious Zionism describes the lives and philosophies of the most important rabbinical Zionists of the nineteenth and early twentieth centuries: Yehuda ben Shlomo Alkalai (1798–1878), Zvi Hirsch Kalischer (1795–1874), Samuel Mohliver (1824–1891), Jacob Reines (1839–1915), Abraham Isaac Kook (1865–1935) and Judah Leib (Fishman) Maimon (1875–1962). They joined secular Zionists in the struggle for the re-establishment of a Jewish national home – an unusual act for their time – and had to contend with fierce opposition and condemnations from many rabbis in Eastern Europe, who believed that the return of the Jewish people to its ancestral homeland of Israel depended upon the arrival of the Messiah. 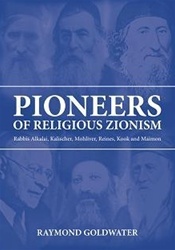 In their lives and writings, Rabbis Alkali, Kalischer, Mohliver, Reines, Kook and Maimon provided the foundation on which modern religious Zionism was built.